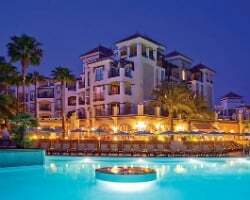 Andalucia's impressive Costa del Sol region is all yours with a luxury timeshare unit at Marriott's Playa Andaluza. Find timeshare resales and rentals priced up to 70% off retail today. Sprawled along Spain's magnificent Costa del Sol, the Marriott Playa Andaluza brings a distinct European feel to its tropical location. Lined by green palm trees and sapphire waters just beyond, the Playa Andaluza is a masterclass in luxurious beachside accommodations. With no shortage of on-site amenities—which include a gorgeous swimming pool and sundeck, a health spa, and a restaurant serving Mediterranean-inspired dishes—you'll be immersed in the relaxing vacation atmosphere that only an upscale property like the Playa Andaluza can provide. The suites at the resort are split between efficient guest rooms ideal for couples and honeymooners, as well as grandiose multi-room villas made to accommodate families and larger groups. Whether you're celebrating your marriage or seeking a fun-filled European getaway for you and the kids, there's space for you at the Marriott Vacation Club Playa Andaluza. With modern amenities and desirable furnishings like private balconies, fully-equipped kitchens, and even laundry machines, you'll have everything you need to create your dream beach getaway. Are you ready to secure these amazing accommodations? Fill out the form on this page to get more information about owning a timeshare at the Playa Andaluza, or call a representative at 1-877-815-4227. Buying a timeshare at the Marriott Playa Andaluza can guarantee you a truly unique future of vacations to Spain filled with amazing owners-only benefits. However, if you buy that timeshare on the resale market, you could acquire the same great product for thousands less. Resale units are offered by current owners, and not the resort itself, meaning prices for ownership intervals at the Playa Andaluza are much more realistic. Resale postings often include discounts of up to 70% off retail pricing, allowing you to save big. These Marriott Vacation Club Andalucia timeshare resales come in the form of deeded fixed and floating Marriott timeshare weeks spread through the Silver, Gold, and Platinum seasons. You'll find a great spread of ownership styles, unit sizes, and price points available to you, ensuring you won't have to settle for accommodations you don't love. 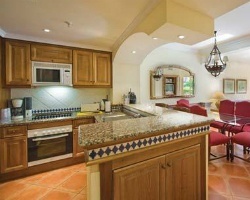 Additionally, your resale at the Playa Andaluza could result in a world of exclusive vacation perks and privileges. 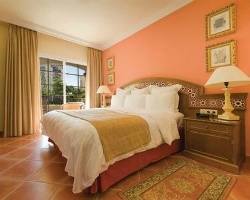 The Playa Andaluza is affiliated with the Marriott Vacation Club, one of the world's most popular timeshare brands. Buying a timeshare resale at the resort can give you instant access to some of the club's best owner privileges through upgrading your ownership. For example, becoming a club member and converting your timeshare week to Marriott Vacation Club Destinations points can lead to a more flexible way to plan vacations. You can also use your points to explore other destinations by exchanging your timeshare internally at other Marriott resorts. The Marriott Playa Andaluza is also affiliated with Interval International, one of the world's leading timeshare exchange companies. With a separate Interval membership, you can use your timeshare resale to travel the globe. Just deposit your Costa del Sol timeshare into the Interval exchange network and trade for stays at comparable resorts in destinations across Europe, the United States, and beyond. Additionally, the Andaluza is an Elite-rated resort, which means you'll be able to exchange with other Elite resorts and won't have sacrifice quality when making a trade. This upscale Costa del Sol timeshare resort is awash in luxury, offering the best on-site amenities for you to truly enjoy your trip to Spain. Relax by the resort's crystal-clear swimming pool, just steps from the ocean. Sprawl out on the sundeck to take in that Mediterranean sun, or relax in the hot tub. The Playa Andaluza also features a mini golf course as well as tennis courts and a fitness center to stay active. Adults can drop the kids at one of the resort's coordinated children's activities and head to the Marriott Playa Andaluza Spa to book rejuvenating treatments like body wraps or massages. For dinner, the resort offers decadent Mediterranean-style cuisine at the Solera Restaurant & Spa. Around the resort, you'll find days of instant fun out on the waters of Playa Matas Verdes. Spend your days swimming or sunbathing on the beach, or take to the surf to try wakeboarding or windsurfing. Explore the Costa del Sol region, including the beachside cities of Malaga and Marbella. Explore the zoo at Bioparc Fuengirola, or hit the links at area golf courses like Guadalhorce Club de Golf or Real Club de Golf El Candado. Venture north into the countryside to discover Moorish ruins at Alhambra or the Mosque of Cordoba, or stay in Malaga to see over 200 works of art by Pablo Picasso at the Museo Picasso. 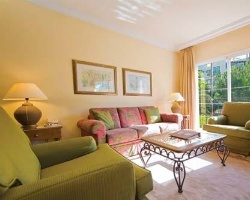 Already Own at Marriott's Playa Andaluza?